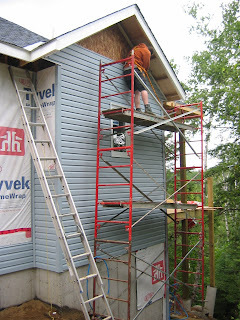 Cottage on the Edge - the DIY Cottage Blog: The Importance of Scaffolding! I can't over emphasize the importance of scaffolding! Installation of the beams for the gazebo and the front porch. Here we see my youngest son, Adric, installing a piece of siding under the gable on the east wall. It may not look so daunting in this picture but when you are standing at the far right of the scaffold, because of the steep slope of the location, it is two and a half stories down - quite frightening for those with a phobia, and quite dangerous if you fall. Adric is also wearing a safety harness with the harness tied of to a secure spot on the Cottage. Doing anything on a slope is very difficult with a ladder, an extension ladder or even the fancy ladder that handles slopes that I mentioned in an earlier post. You are constantly moving and stabilizing the ladder - plus you need two. With scaffolding you put it up once, and only need to move the platform up as you move up the wall. In this picture you can see that we used two platforms. I still love my "World's Greatest Ladder" but the scaffolding is better suited when two people need to install long / big pieces of material at a height. RECOMMENDATION: If I did it again I would get the scaffolding much earlier, I would get 4-foot scaffolding, and I would get more scaffolding. The scaffolding you see here is 2-feet wide by 5-feet tall, and is only 10-feet long. When the highest platform, shown here between the third set of scaffolding, the 2-foot platform just seemed a bit narrow. I would get three more side pieces and the associated braces so that the platform could be longer and hence would not need to be moved as much.